Ischgl has a claim to be Austria's top ski resort - and yet the village is one of the least 'Austrian' of the country's best-known destinations. There is very little left of the poor and relatively isolated farming communities which existed before the 1960s. The expansion of the ski lifts into the Silvretta mountains was the spur for an incredible tourist boom in the area - a boom which has made Ischgl quite similar to some of the French resorts. Now the village is chock-full with modern luxury hotels and apartment houses and the ski resort marketing department - one of the best in the Alps - spares no effort in getting their resort in print. In the last couple of decades the ski slopes have played host toconcerts by Elton John, Bob Dylan, Mariah Carey and Rihanna in the renowned Top of the Mountain concerts at the beginning and the end of the season. And the resort has made it onto the news pages with collaborations with people as diverse as former US President Bill Clinton and party-girl heiress Paris Hilton. One effect of all this promotion has meant that the resort has a deserved reputation for nightlife and après-ski amongst European skiers. 'Halli Galli', as it is called amongst Germans, is a winter equivalent of the Majorca 'Ballermann' experience, with German disco, heavy drinking and a party atmosphere. But, of course, all that promotion means nothing if there is little of substance. Ischgl however can boast an impressive ski area which links to Samnaun, a duty-free village over the border in Switzerland. There are now three lifts from the village centre up into the big bowls above the treeline that form the Ischgl ski area. There is a breathtaking array of runs and chairlifts, with skiing down through the trees available back to resort level and over into Samnaun. Ischgl is renowned for its depth of upmarket hotel accommodation but there are plenty of apartments and guesthouses around the resort as well. It is an extremely popular destination for travel companies from all European nations, although probably not as well-known as it should be on the North American market. Those who are looking to make their own way to resort would be best advised to check the Hotels and Travel tabs above. Location: Ischgl is located in the Paznaun valley in the western part of the Tyrol. Access: The Paznaun valley, like many in winter, can only be accessed at one end and the only means of transport into the valley is by road. Ischgl might not be the most attractive village in the Alps. And many experienced skiers will be able to take or leave the party atmosphere at the bottom of the slopes. But the ski slopes are what bring many regular guests back again and again. Ischgl is probably the closest to a 'French' ski resort that Austria possesses. Lifts head off in every direction into snow bowls above the tree line and it has an added bonus of being able to ski for lunch in another country (the duty-free hamlet of Samnaun in Switzerland). The ski area is extensive by Austrian standards. The altitude means that the season is always long and that the snow is generally in good condition. Popular runs can get crowded in high season but the area is big enough that it is easy enough to find some quieter lifts and slopes. Care should however be taken on the long and sometimes tricky red runs back to the resort, especially at the end of the day when the amount of skiers and boarders using them can make them slick and crowded. Luckily the option of après ski on the mountain and then a gondola back to the village is a viable one. Galtür is an interesting smaller resort on the same lift pass and easily accessed by ski bus. Despite the size of the resort, all levels of skier should find something to interest them for at least a day in the village. Ischgl itself can now boast 45 lifts with 240km of ski runs, while Galtür adds another 10 lifts and 40km of runs. A Silvretta day pass, which covers Galtür, Kappl and See as well as the Ischgl-Samnaun area, will cost 54.50 Euros in the main season. A six-day pass will cost 298.50 Euros in the main season. Cheaper price dates are available for the pre-Christmas period, for two weeks in January and from the second week in April to the end of the season. Guest pass holders (i.e. those staying in the resort) are eligible to buy a cheaper local pass which covers the Ischgl-Samnaun area solely. Ischgl is not the best resort for beginner skiers and families. All of the skiing is up on the mountain and the big bowl at the Idalp which houses most of the easy and low intermediate runs is one of the most crowded areas. Galtür would probably be a better option. 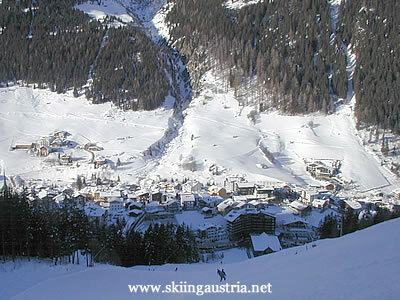 On the other hand Ischgl is a great location for intermediate skiers. The high bowls above Ischgl and the runs over to Switzerland all offer interesting challenges, but the flexibility offered by the number of lifts to those who can get around on red runs is the main draw. Advanced skiers will find some tougher black runs over on the Palinkopf and Greitspitze area, as well as some excellent off-piste opportunities when snow conditions are suitable. Ischgl is a very compact resort with accommodation clustered around the base stations of the high-speed gondolas and cable cars up onto the slopes. Like some of the other higher resorts in the western part of the Tyrol, Ischgl tends to get a reputation based around the luxury end of the accommodation spectrum, especially with the publicity surrounding some of the antics of the more famous guests. There are, however, plenty of guesthouses and apartment buildings offering accommodation both in the centre and on the edge of the resort. Having said that, Ischgl is by no means one of the cheaper Tyrolean resorts. All those lifts up on the mountain and the apres-ski atmosphere can come at a cost. Those who are looking for something a little bit more at the cheaper end might consider the hamlet of Mathon, between Ischgl and Galtür and on the ski bus line. While Galtür itself is a pleasant smaller resort with its own interesting ski area and more suitable for those seeking a quieter life yet still with access to the attractive lift system. The search box to the right (or below if you are using a smartphone) gives an availability check for particular dates for all of the accommodation in Ischgl. The location of Ischgl is a little bit misleading when looking at it on a map (or when using some web-based direction services). As with many of the western Austrian resorts, mountain passes which are accessible in the summer are closed for the entire winter. In the case of Ischgl this means that the route via the Vorarlberg through the Montafon and over the Silvretta toll road is impassable and that the only way up to Ischgl is via the Paznaun valley starting near Landeck in the Tyrol. That has a knock-on effect with the choice of airports - as can be seen from the list above, Innsbruck Airport is by far and away the most convenient of the major charter and scheduled flight centres during the winter season. The nearest rail connection to the resort is 30km away down in the main valley at the Landeck-Zams railway station. There is a regular bus service (roughly every hour through to the early evening) up to Ischgl. Journey time is around 1 hour. Alternatively there are local taxi services who offer transfers to and from the railway station. Alternatively, there are airport transfer services from Innsbruck and Munich. As always those who are with their own transport should ensure that their vehicles meet the legal winter minimum (winter tyres and snow-chains in the car). Although the route up the Paznaun valley crosses no passes, it can be tricky in bad weather. Those with their own cars can access the Paznaun road by heading to Pians, just to the east of Landeck on the motorway coming from Innsbruck or, for those arriving from the west, at the end of the last tunnel on the Arlberg express road. From Pians the straightforward route winds up through the smaller resorts of See and Kappl until it reaches Ischgl. The ski season opens for winter 2017/2018 on 23 November and runs through to 01 May.